Fitzgibbon was born in Omaha NB. 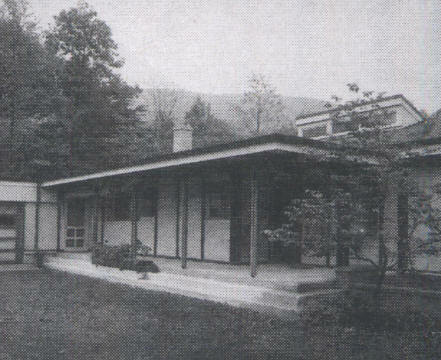 The family moved to upstate New York where Fitzgibbon completed studies at Onondaga Valley Academy in 1932. The following year he graduated from Syracuse Central High School. In 1933, he entered Syracuse University’s School of Architecture as a Gifford Scholarship student and graduated with a Bachelors of Architecture in 1938. Fitzgibbon earned a Masters in Architecture from the University of Pennsylvania in 1939, where he won the Warren Prize and was a finalist for the Rome Prize. In November 1940, Fitzgibbon married fellow Syracuse student Margaret Inez Crosby of Falconer NY. His first job was four years as a designer with United Engineers and Constructors in Philadelphia. In 1944, he was appointed associate architect for campus planning at the University of Oklahoma in Norman and also taught as an assistant professor in the School of Architecture. In 1948, Fitzgibbon, Waugh, Matsumoto and others left Oklahoma with Henry Kamphoefner to establish the NCSU School of Design. 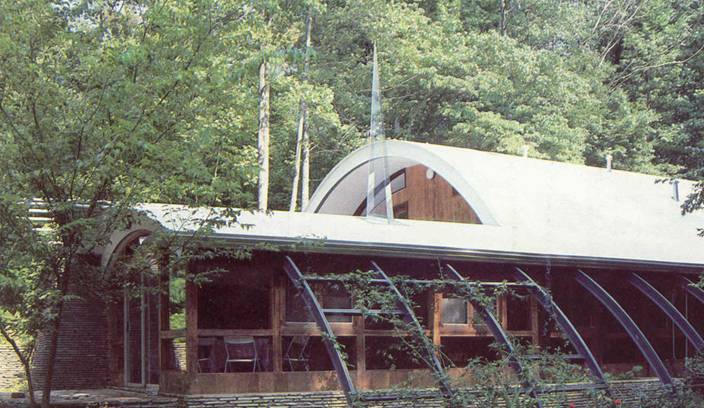 On his road to NCSU, Fitzgibbon met R. Buckminster Fuller at Black Mountain College. 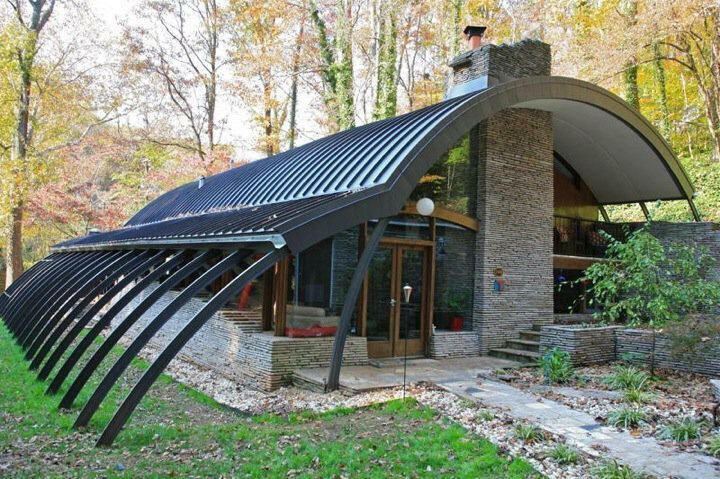 Fuller was the inventor of many geodesic dome applications. In 1955, Fuller and Fitzgibbon and architect/engineer T. C. Howard formed Synergetics, Inc. to focus on commercial dome projects and applications for military, governmental and commercial clients. Fuller left Synergetics in 1958 and T. C. Howard became the firm's owner. Fitzgibbon and Duncan Stewart and several other NC State professors formed Skybreak Carolina Corporation to research geodesic domes. Fitzgibbon and Fuller worked on the Old Man River Project, an $800 million urban renewal conceptual city designed to house 30,000-50,000 people under a massive dome in East St. Louis IL that was never built. 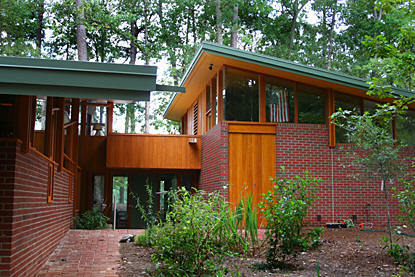 Fitzgibbon served as the associate architect for NCSU campus planning and an assistant professor of architecture before becoming a full professor in 1953. In 1968, Fitzgibbon took a leave of absence from NCSU and Synergetics to teach as a visiting professor of Architecture at Washington University in St. Louis. He stayed there for the rest of his life, except for visiting professorships at the University of California-Berkeley and Harvard University. Fitzgibbon had some of his work exhibited at the Museum of Modern Art in a show called Visionary Architecture. This featured his drawing of a city built in several stories over the Hudson River between NYC and New Jersey. 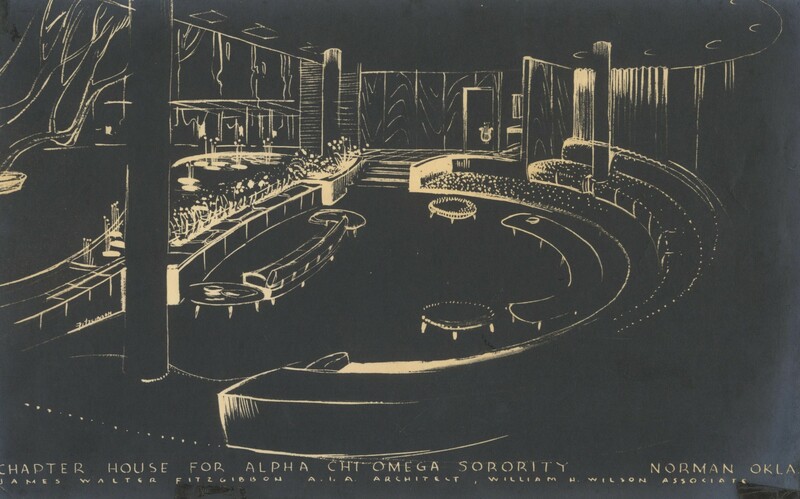 His drawing was placed between Frank Lloyd Wright and Louis Kahn, his professor at the University of Pennsylvania. 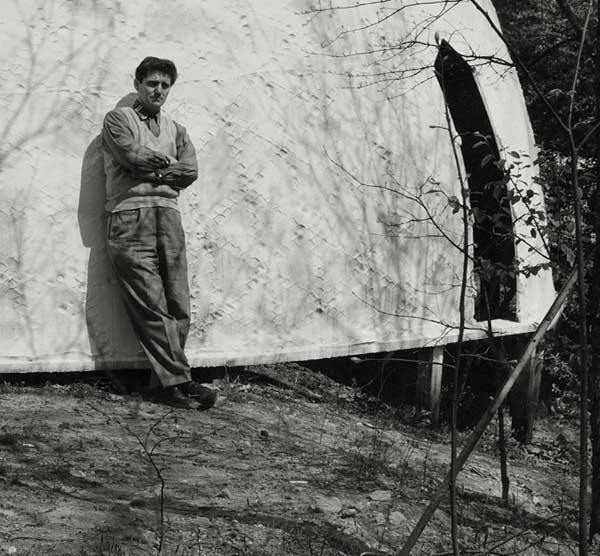 Around 1950 - Fitzgibbon next to an early geodesic dome prototype in Raleigh. It was sold to the government and the Marines airlifted it from his backyard, according to Katrina Fairley, daughter of T. C. Howard. Photo by Joseph W. Molitor. 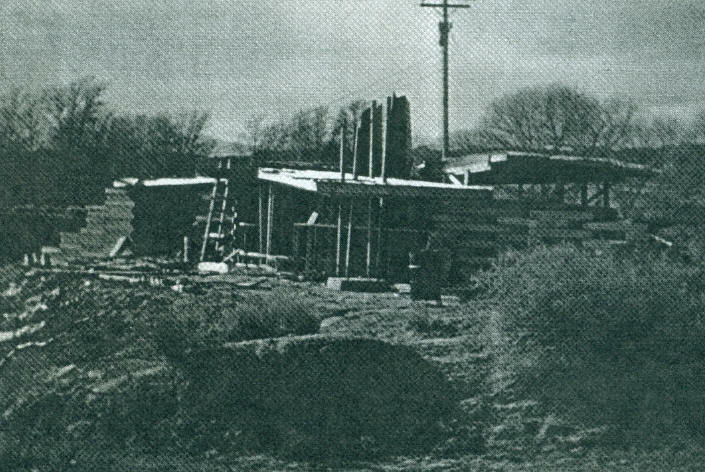 1947 - The Francis Joseph Fitzgibbon House, 27A Camino Cerrado, Pojoaque area of Santa Fe NM. Designed as a wedding present for his brother. The couple moved out after a few years. Sold several times. B/W photos provided by Marifrancis Fitzgibbon Hardison, Jim Fitzgibbon's sister. Has been dramatically altered and expanded. 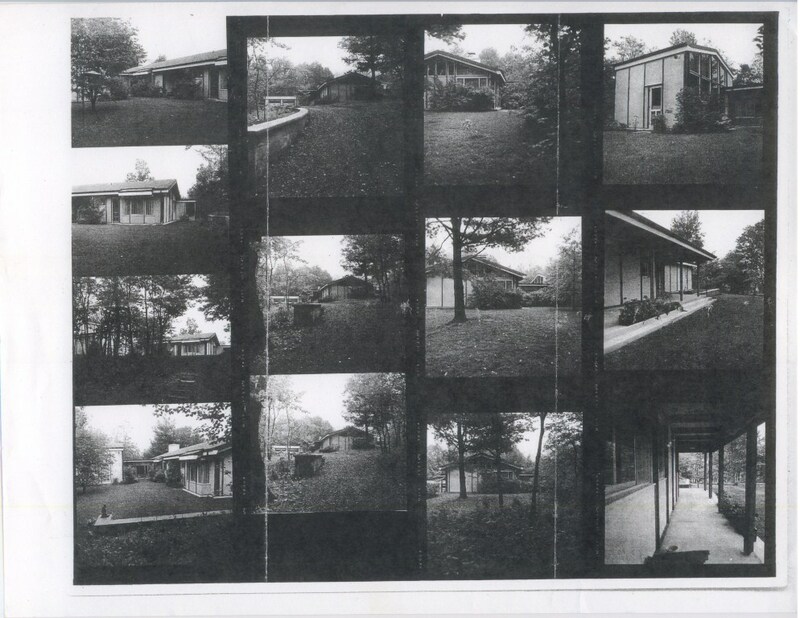 According to grandson Joe Fitzgibbon, the house is now the office for Pojoaque Terraces Manufactured Housing Community LLC, a mobile home park, bottom photo. 1947 - House in Salisbury Cove ME. No address or photo. Calls to the local fire station and post office did not yield any recollections. 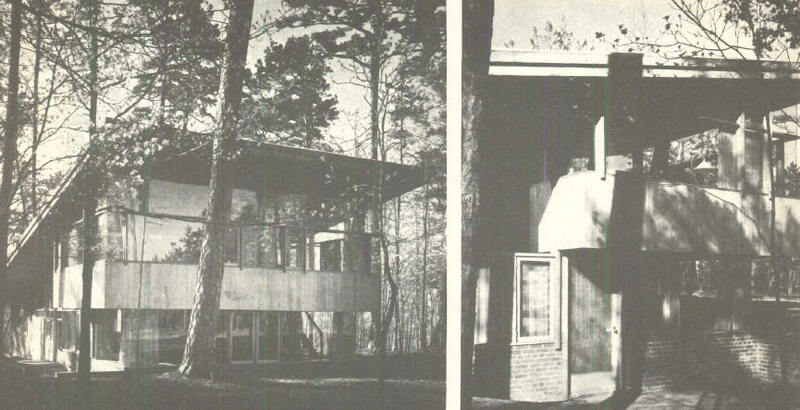 1948 - The Ellen Douglas Cleveland House, 1066 Fire Tower Road, Sewanee TN. Cleveland built the house after her divorce from Richard Cleveland, son of President Grover Cleveland, in 1948. 4467 sf. Sold to William Griffin around 1959, just before he married. In 1968, according to his wife Anne Griffin, they did have to "tear part of it up due to some faulty wiring" but were careful to repair it in the same design. As of 2011 still owned by Anne Griffin. 1948 - The James and Margaret Fitzgibbon Renovation, 617 Kirby Street, Raleigh. He did a tremendous amount of renovation, for example, the front door was sealed up and the entry was through the back porch and then into the kitchen, which he had opened into the living room to make one large room. 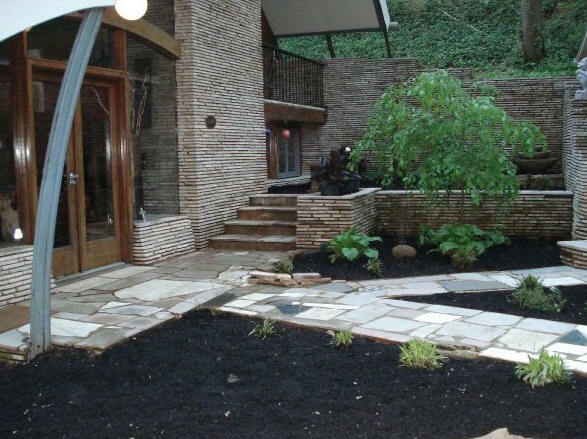 When he put up the addition years later, it was hooked onto the same back porch which was filled in and made into an entry hall for both parts of the house. Sold to Margaret Dent in 1971. Sold to Yale Patt in 1972. Sold to Rene and Joan Langford in 1981. Sold to The Kirby Group in 1985. It was about to be destroyed when David and Shanda Davenport bought it in 1991. 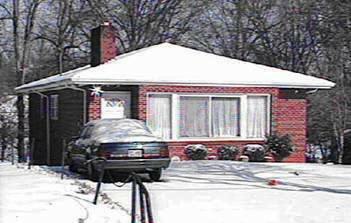 Sold in 1995 to Aly G. Khalifa and Jennifer R. Snyder. Snyder's portion was bought out by Aly Khalifa shortly thereafter. 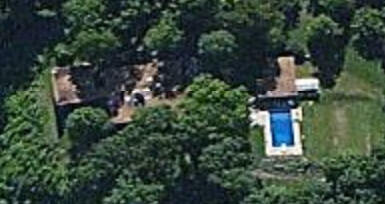 As of 2011 still owned by Aly and Beth Khalifa. 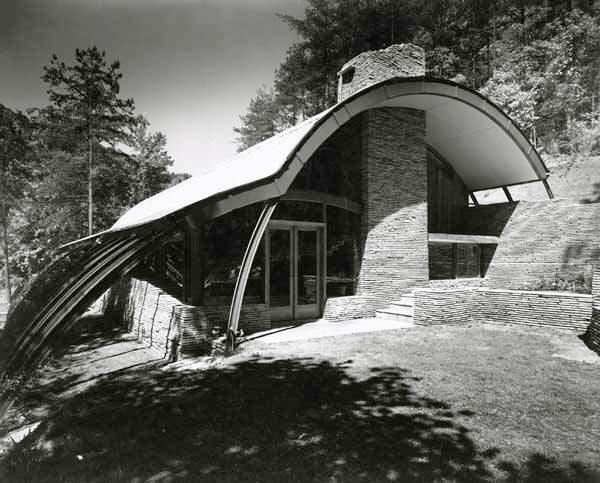 1949 - The Betty Kirby-Smith House, aka Crash Landing, 359 Florida Avenue, Sewanee TN. Built by Riley Finney. Transferred to Kirby-Smith's son David Clough and his wife Mary McCleaf. As of 2010 transferred to David Clough. 1950 - The George and Beth Paschal House, 3334 Alamance Drive, Raleigh. 3340 square feet, built by Seby Jones of Davidson and Jones. Destroyed 2013. 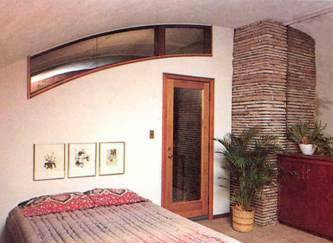 Photos by George Smart, Charles Uzzell, SellModern. 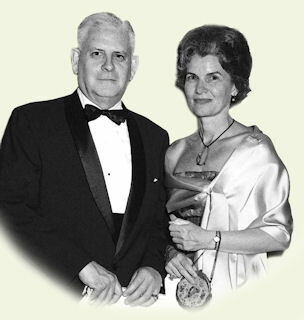 During WWII, George Paschal became engaged to Beth Eleanor Cummings, the associate editor of The Farm Journal, a magazine published in Philadelphia. Born in Lohrville, Iowa, in 1917, she grew up in Ames and received her Bachelor of Science degree in Home Economics and Journalism from Iowa State University in 1939. The couple married in 1944. Two years later, with the war over, they decided to leave Philadelphia for Raleigh. After failing to find an existing house on the market in Raleigh that pleased them, the Paschals decided to build a new house. Beth Paschal called Dean Henry Kamphoefner (a fellow Iowan) at the newly formed NC State School of Design to ask his recommendation for an architect. 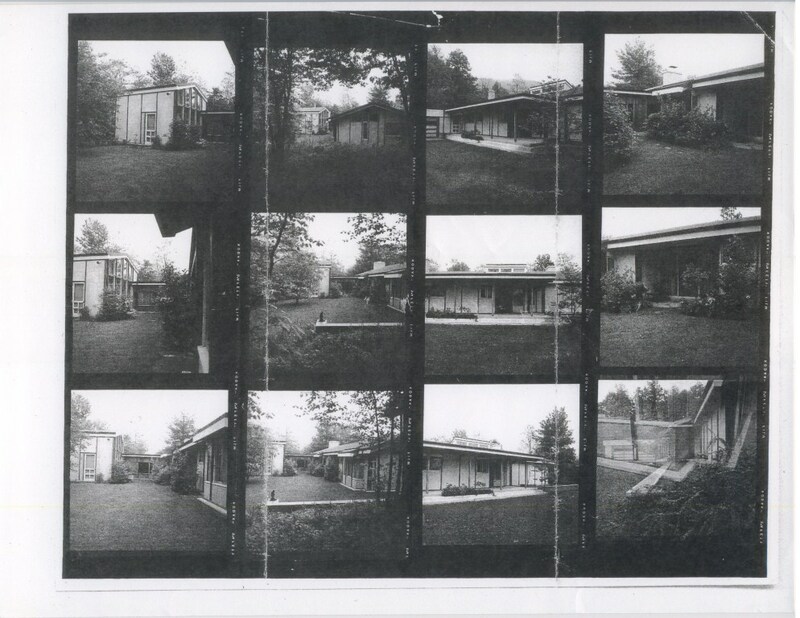 Kamphoefner told her that professors at the School of Design were encouraged to design a house periodically, and he sent her a number of books on modern architecture. 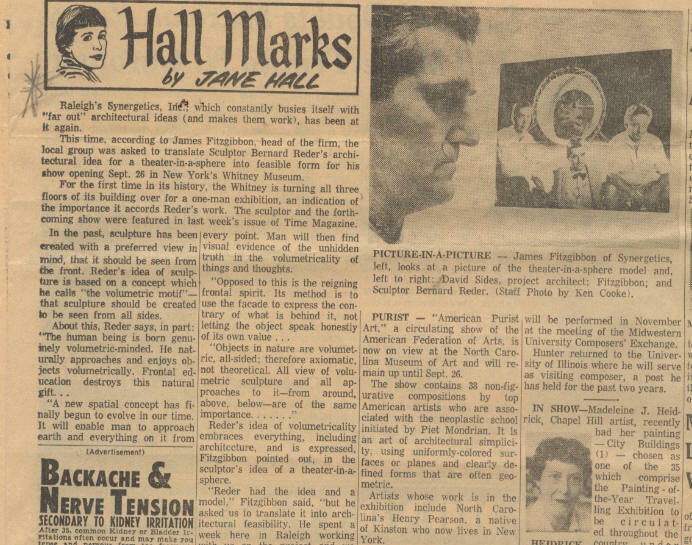 When she had finished looking through them, Beth Paschal and Dean Kamphoefner talked and Kamphoefner recommended James Fitzgibbon, an associate professor at the School, to design the Paschal house. The design process for the Paschal House involved a number of meetings between Fitzgibbon and the Paschals to review his plans, receive comments, and discuss suggestions from the clients. For example, it was George Paschal's idea to have a circular driveway at the front of the house. And he wanted a separate, covered, outside entrance to his study that would enable him to return from late-night house calls without disturbing the family or being exposed to the weather. The Paschals both wanted a house that would bring the outside in, and that would be all on one level. The irregular rectangular mass of the house presents two different faces: the (north) Alamance Road side, which is a mostly closed, picturesque composition of stone walls and multiple, low-sloped gables with deep overhangs; and the (south) rear elevation, which is comprised of expanses of glazed walls set under a single large gable. 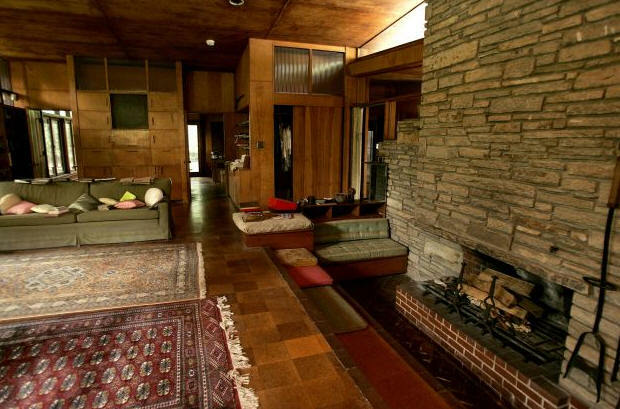 The central focus of the interior is a dramatic, high-ceilinged living room arranged in a Frank Lloyd Wright fashion around a massive central fireplace with a sunken hearth. With glazed walls on both sides of the room, the thin planes of the roof appear to float over the space and it is possible to look completely through the living room to the treetops beyond. 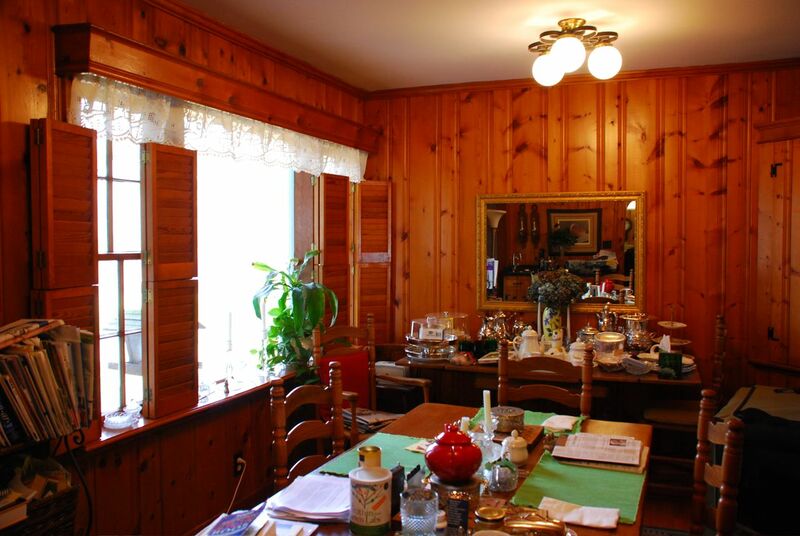 The house is oriented to the sun, making best use of passive solar climate control. The carefully detailed interior spaces of the house are finished with warm, natural-finished veneered plywood paneling, cork flooring, and substantial amounts of gray/tan Wake County granite random ashlar stonework. The house retains the integrity of its setting, materials, workmanship, and ambience. The Paschal House is set well back from the street at the edge of a plateau. The land drops behind it in a mostly wooded slope to Pasquotank Road on the south. 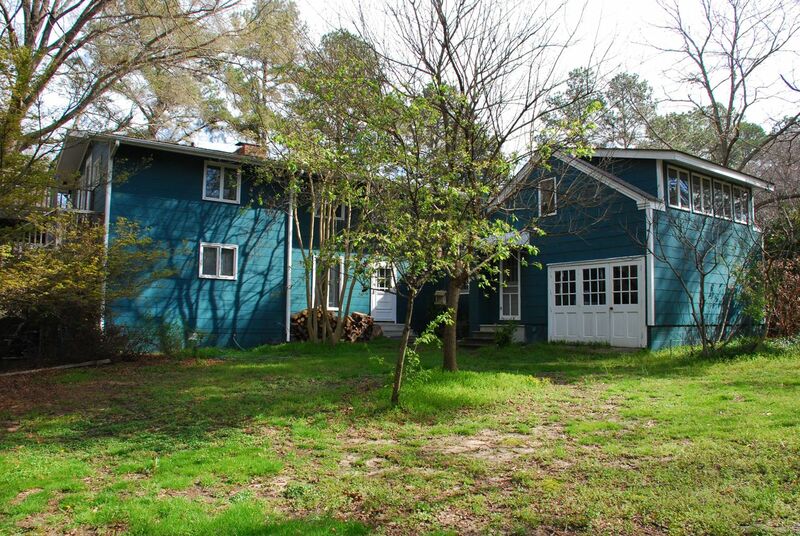 Mature hardwood trees along the sides of the property seclude it from adjacent houses. Two low, elemental stone lanterns flank the entrance drive to the lot from Alamance Road. 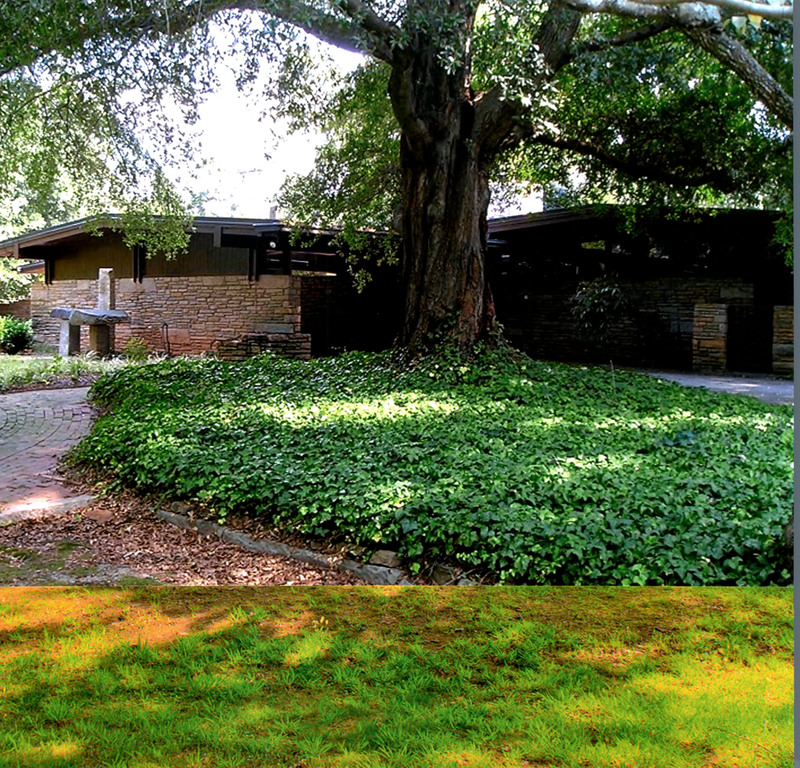 The broad, circular driveway just inside the entrance encloses five large live oak trees that offer shaded parking for a dozen cars. Also within the trees is a brick-paved walkway lined with carefully trimmed shrubs that form an inner ring, at the south end of which are additional elemental stone sculptures. The house takes on a different appearance when viewed from the street (north) or from the terrace (south) side. On the street side, the building is defined by a series of very low-sloped gable roofs with deeply cantilevered eaves over random ashlar stone walls. A gabled porte cochere, screened by a stone end wall, projects from the front of the house. 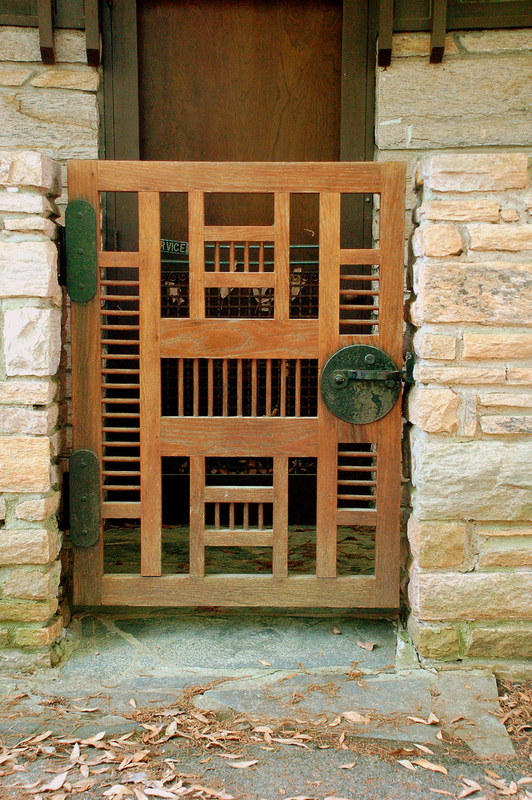 Behind the porte cochere are two artisanal wooden gates (fabricated at the NCSU School of Design) that open into a small, walled courtyard set before the kitchen/dining room wing on the right, and into an atrium at the center. The flag-stoned atrium is open to the sky and provides light for the windows of the kitchen and the office that open into it, and to the glazed wall of the house's main corridor. At the back of the atrium, adjacent to the main entrance to the house, is a rectangular pool fed from the roof drainage at the junction between two gables, providing a waterfall when it rains. This pool is the only survivor of three small pools in the original design. The other two, located adjacent to the master bedroom and near the front entrance to the house, were filled in to protect the Paschals’ three children. At the west end of the house is a large kitchen with adjacent utility rooms, behind which is the dining room. At the east end of the house is the office/bedroom wing, which contained George Paschal's study and the master bedroom on the front, with bathrooms and two additional bedrooms at the rear. Adjacent to the master bedroom, at the east end of the house, is a stone-paved terrace shielded from the street by an angled stone wall. 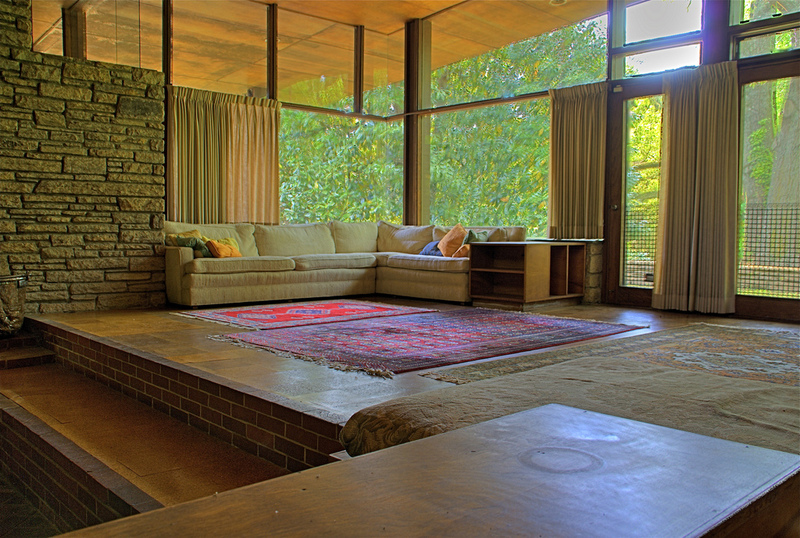 In typical Modernist fashion, the focal point of the interior, and its largest space, is the living room. Its high, sloped ceiling comes to a peak at a corner of the central feature of the room, a massive random ashlar stone fireplace. 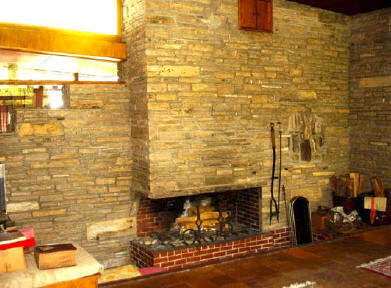 The breast of the fireplace creates most of the north wall of the space, stepping down to form a divider between the hall to the north of it and the living room. 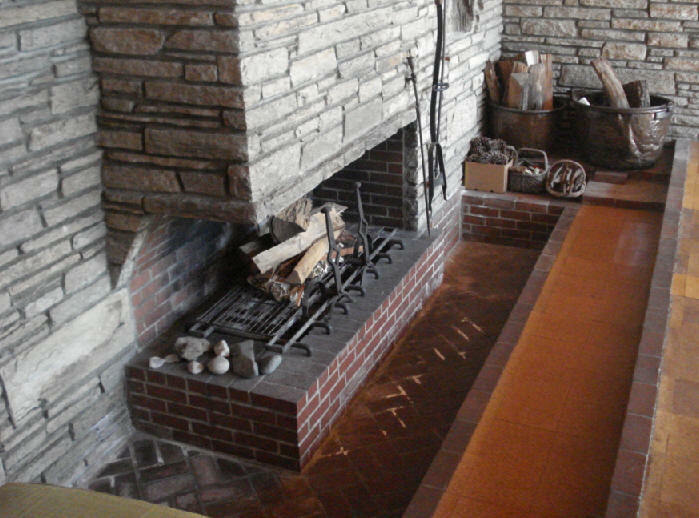 Its expansive, brick-based firebox, located on a corner of the fireplace, is in an L-shaped, stepped, "conversation pit" depressed below the main floor level -- another detail borrowed from Frank Lloyd Wright. 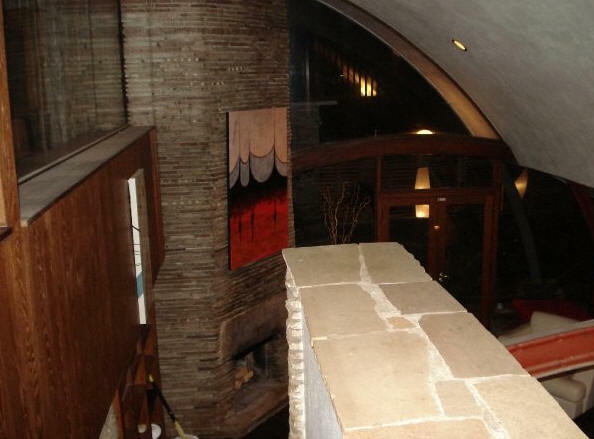 Set in the chimney breast, adjacent to the firebox, is a section of a petrified tree trunk from the Sahara desert that George Paschal brought back from North Africa during World War II. 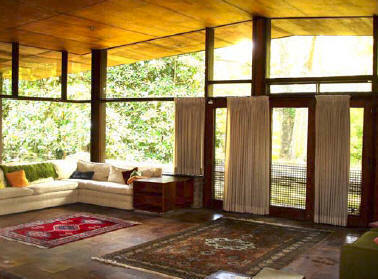 Half of the east wall and the entire rear wall of the living room are glazed from floor to ceiling. Relatively slender posts support the broad expanse of the roof, joined by a narrow cross member above head height. This light framework contains an irregular pattern of large panes of glass set in thin mullions, making the roof plane appear to float above the living room. At the north side of the room, the intersection of two gable roofs is filled with a large, triangular window that frames views of the treetops beyond. These substantial areas of glazing on both sides of the living room give the space a transparency that makes it possible to look entirely through the house from rear to front. 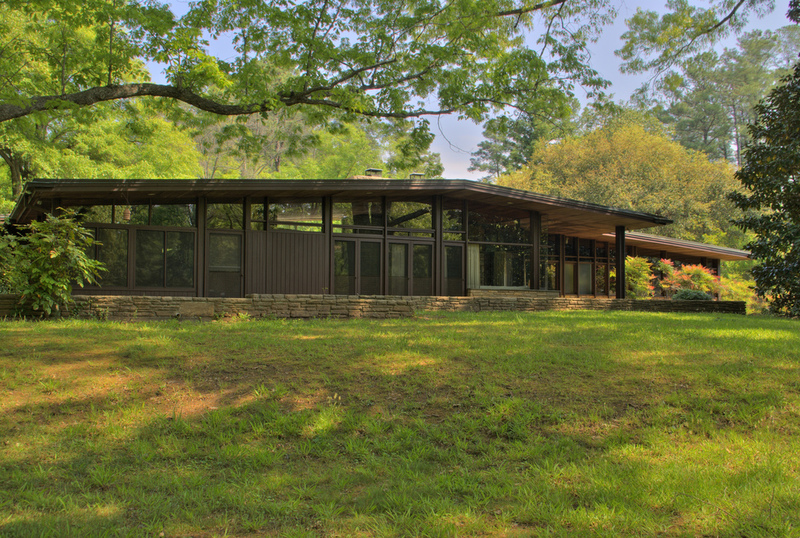 Future Raleigh Mayor Seby Jones of Davidson & Jones Construction Company built the house between 1949 and 1950. So dramatically different was this house from other residences in Raleigh that it attracted a large number of curious onlookers. 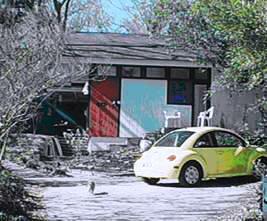 The Paschals moved into the house before it was completely finished, prompting encounters with people who continued to drive through the property or come in through the windows. 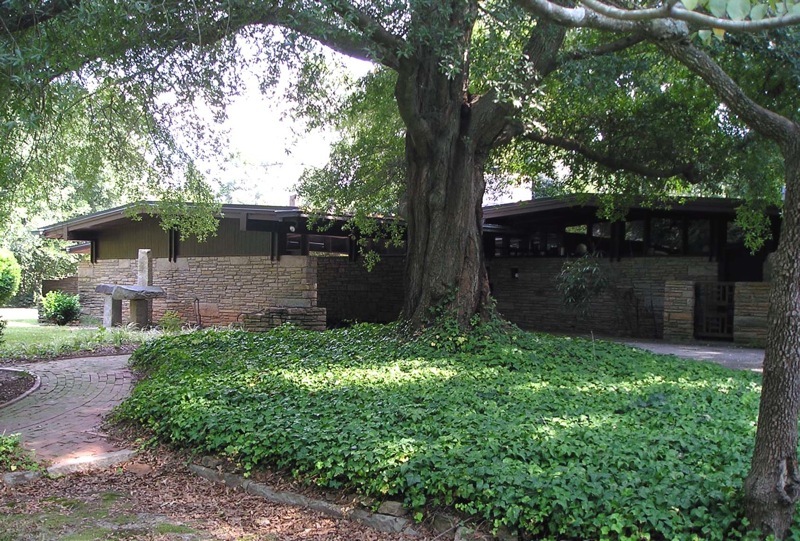 Renowned California architect Harwell Hamilton Harris FAIA, who taught at NC State University’s School of Design, deemed the Paschal House one of the finest examples of mid-century modern residential design in the South. Frank Harmon, Professor of Practice at NCSU and architect of the AIA North Carolina building in Raleigh said in 2012: "In many ways, it's the cutting edge of architecture today. 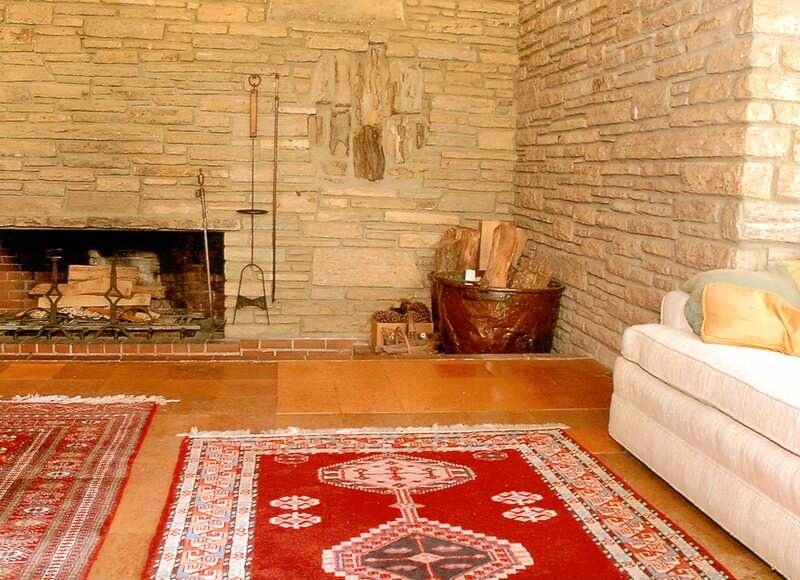 You hear a lot about sustainability: using local materials, natural heating and cooling. 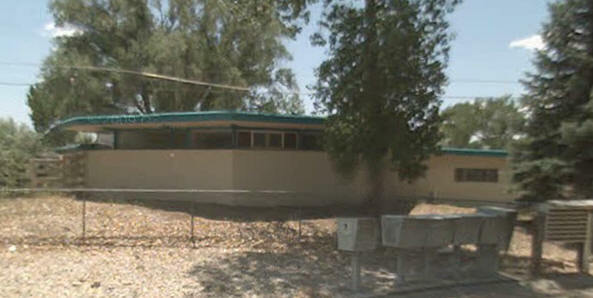 And here is a building that's been doing it for more than 50 years. 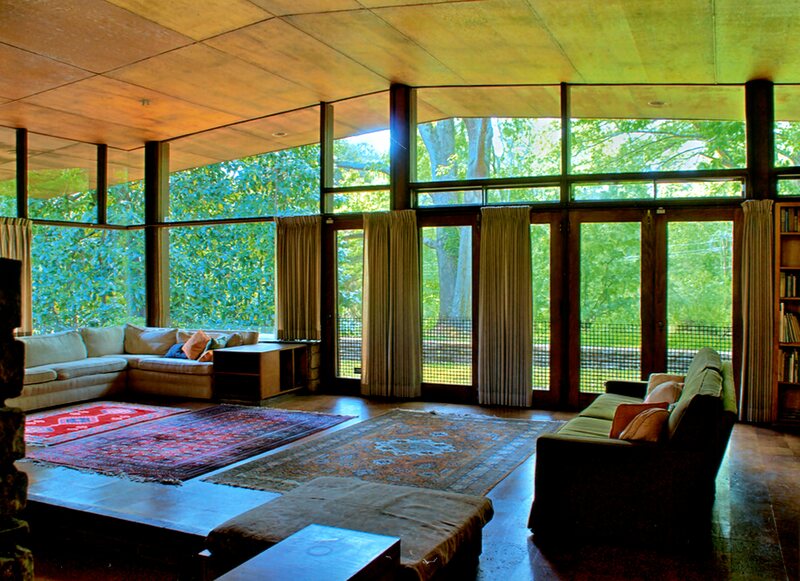 I personally think this is, flat out, the greatest modern house in North Carolina." 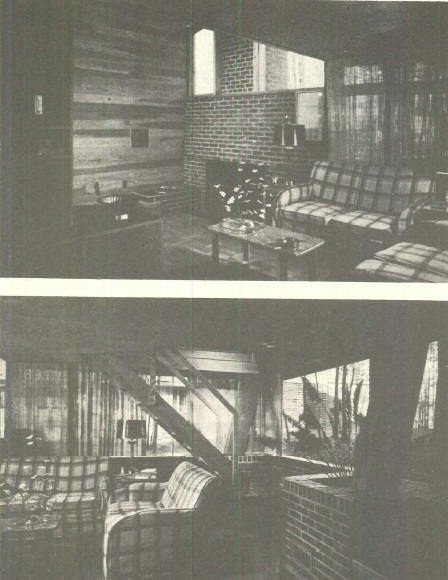 Recalls Wilmington architect Charlie Boney,"during my last year in the [NCSU] school of Architecture the Fitzgibbon/Paschal house was a very interesting example of good creative architecture. Fitzgibbon, at the time was audacious, and I wondered how he got the client to go along with his interesting features of the interior design. 'It is no secret,' he said. 'I had the lady of the house help me design the linen closets and she was involved with measuring all of the sheets and towels, while I went about designing those features that could have been controversial.' 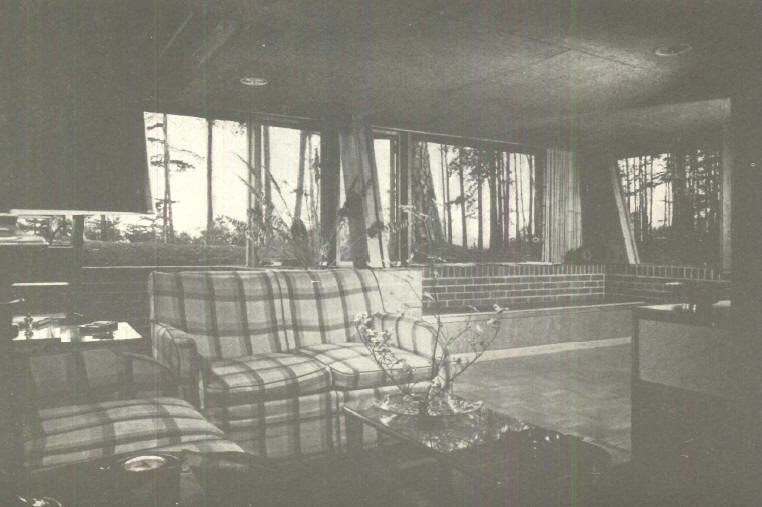 I was so interested in the house that every weekend I would take my date before dinner to see what "new" had been produced during the week. Fortunately, my date thought it was an interesting house also. 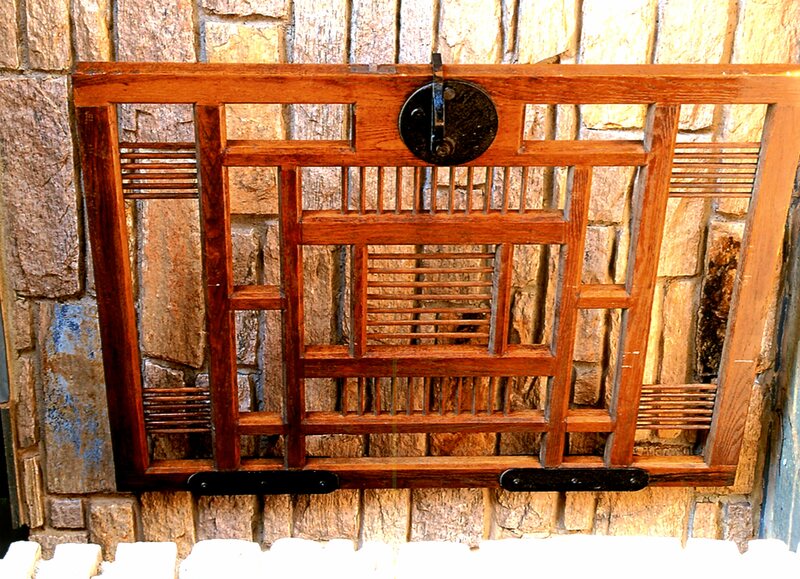 Fitzgibbon produced a wonderful piece of Architecture, for an obviously wonderful and supportive client." The house was put on the National Register of Historic Places in 1994. Alone there for a number of years after George Paschal passed away, Beth Paschal moved out in early 2007. She died in 2009. Her heirs, children Robert, George, and Huston, inherited the property and put it on the market for over $5M, an exceptionally high price even back then. There were no offers at that price. The heirs insisted on selling all the acreage to one party, refusing to subdivide off the iconic house. Since 2008, Preservation North Carolina unsuccessfully attempted to persuade the heirs to subdivide the lots and sell the house separately, insuring the building’s future while still bringing the family a strong return. 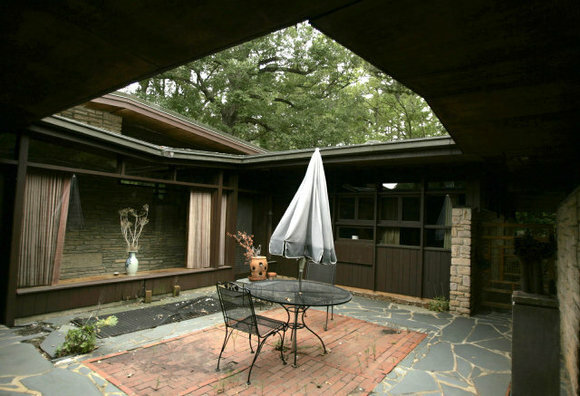 Despite many attempts by NCMH, Preservation North Carolina, and others to bring attention and willing buyers, the heirs refused to rent, allow tours, or even permit a design competition to create new preservation options. As time went by, and the price stayed atmospheric, the heirs chose to leave their childhood home vacant, unmaintained, and unoccupied. In late 2011, the price was reduced to a still-high $3.3 million. In the early fall of 2012, the heirs solicited a deconstruction bid from Habitat. This had TMH lead an online petition drive which garnered over 400 signatures. As of late 2012, the heirs began prohibiting real estate agents from showing the house. 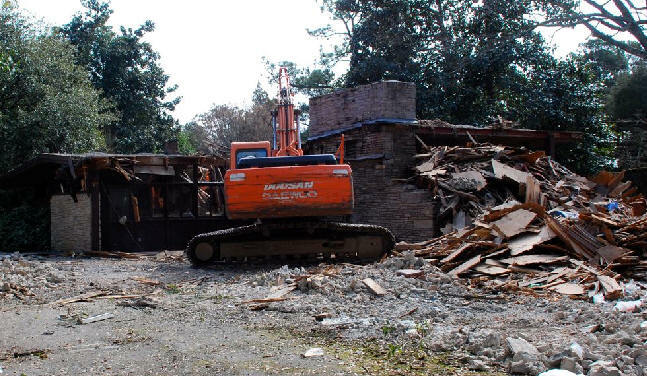 Despite having several serious parties in early 2013 wanting to buy the house and invest in repair, on Friday, March 1, the heirs had it destroyed by a private demolition contractor. The house was hauled to the dump, and the land was divided into five parcels with houses in the $2M+ range. 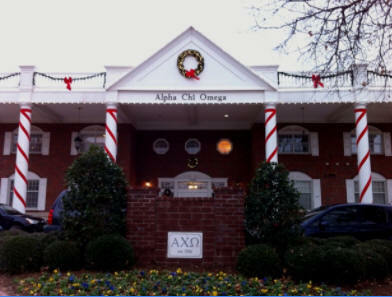 The News and Observer also reported on the demolition. 1950 - The Ralph and Nancy Fields Fadum House, 3056 Granville Drive, Raleigh. 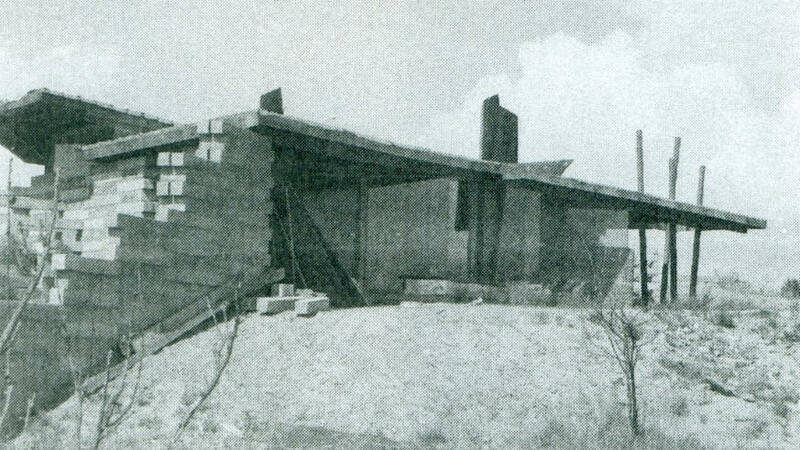 Featured in the October 1951 edition of Architectural Record magazine. Built by Frank Walser. Nancy Fadum had it placed on the National Register of Historic Places in 1993. 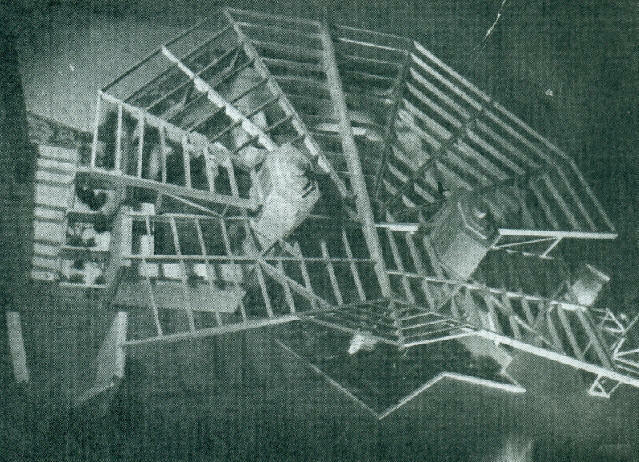 Damaged during Hurricane Fran. 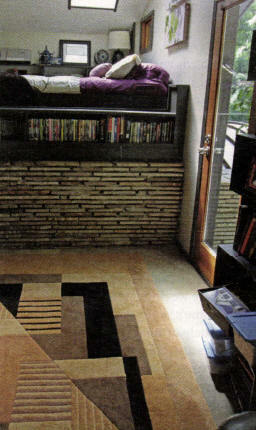 Donated to the NCSU School of Design upon her death in 2002. Sold to Nick and Julie Fountain in 2004. Still owned by the Fountains as of 2015. 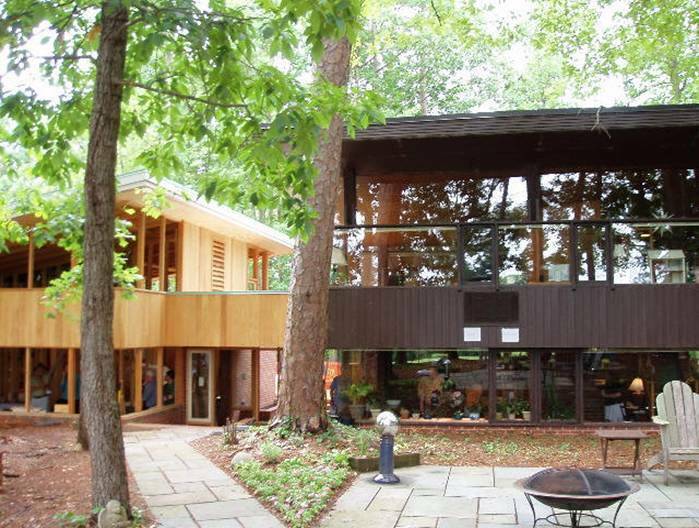 A sympathetic addition was designed by architect Brian Shawcroft and built by Tom Brown of the Splinter Group. The Fountains expanded and renovated the notoriously small kitchen in 2009. 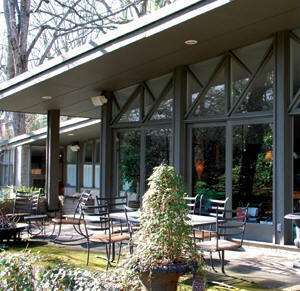 Won a Capital Area Preservation award in 2009, plus a Sir Walter Raleigh Award from the City of Raleigh. Photos by Leilani Carter, Sally Greene, Ormando Harris, and David Hunt. Early B/W photos by Joseph Molitor. 1950 - The Robert Daniel House, 2701 Woodson Drive, Knoxville TN. This is Fitzgibbon’s most famous house. 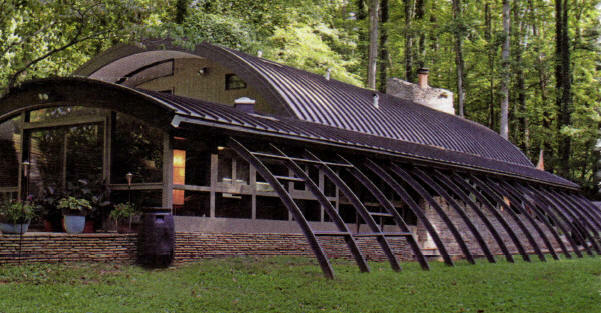 The structure was built into a hillside from salvaged Quonset hut structural supports. The Daniels sold it to Neal Cantrell in 1961. Cantrell died in 1970 and his family let the site deteriorate. 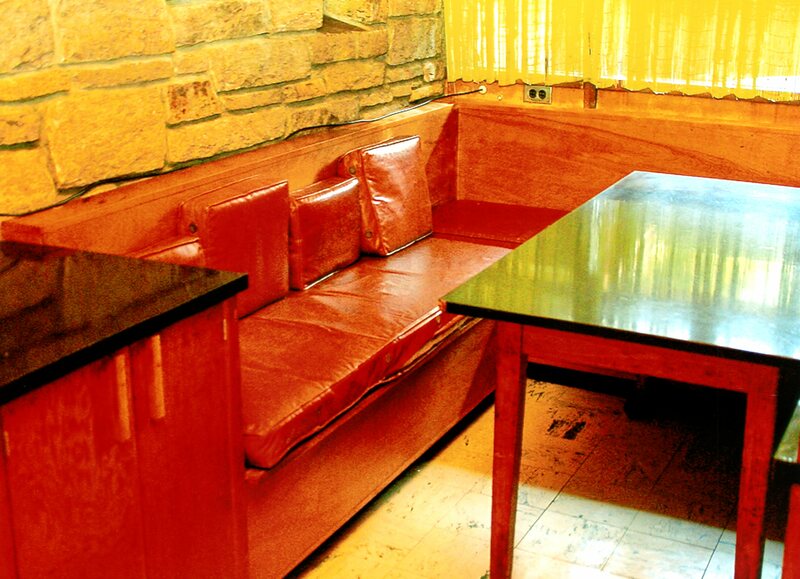 In 1982 architect Peter Calandruccio bought it for $37,000 and began renovation. 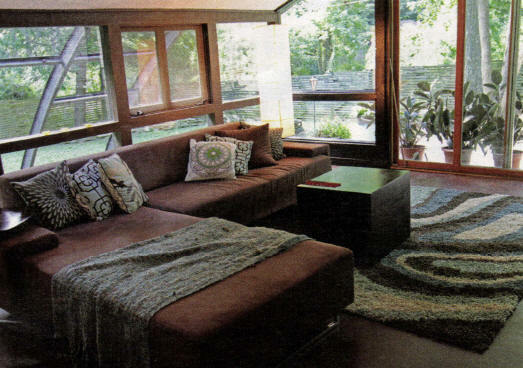 In June/July 1986, Fine Homebuilding magazine published Calandruccio’s extensive account of the renovations (including most of these pictures). Fitzgibbon was a guest of Calandruccio’s shortly before he died. Donald Renfroe bought it in 1993. Johnny and Sonja Miller bought it in 2001. Sold in 2008 to Justin and Lexi Whitaker, who took the bottom three photos. Additional photos. On the National Register of Historic Places. Bottom three photos by Justin Fee. 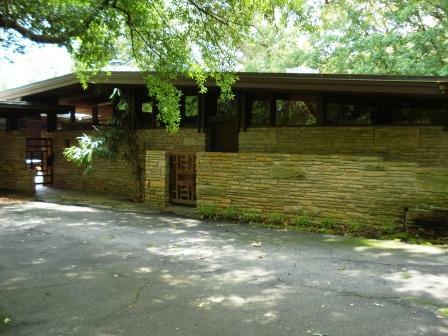 1952 - The Fred and Edna Garvey Residence, 440 Fairfax, Winston-Salem NC. Designed by Fitzgibbon for the parents of Fred Jr., a student of Fitzgibbon. Sold to Scott and Heather Tucker who still owned it as of 2012. Top photo by Kaila Hires. Bottom photo by Heather Fearnbach. 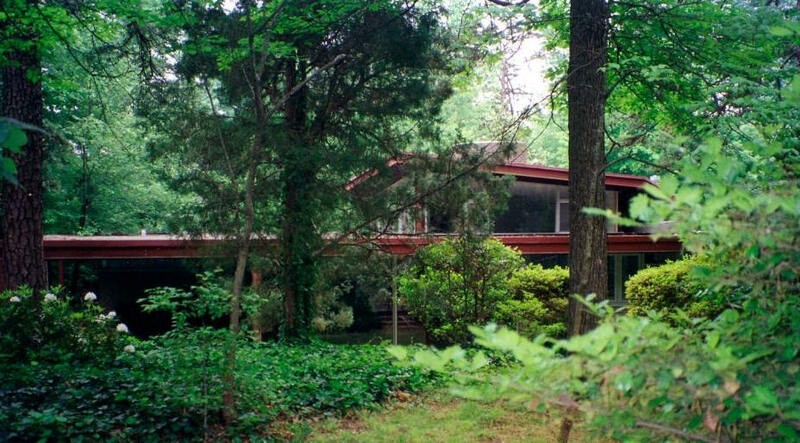 Approximately 1952 - The Winston Roberts Residence, 271 Canterbury Trail, Winston-Salem NC. Sold to Robert Lyndgren, the NC School of the Arts founding Dean. Sold in 1993 to Kimberley J. Hansen who did a renovation. As of 2012 still owned by Hansen. 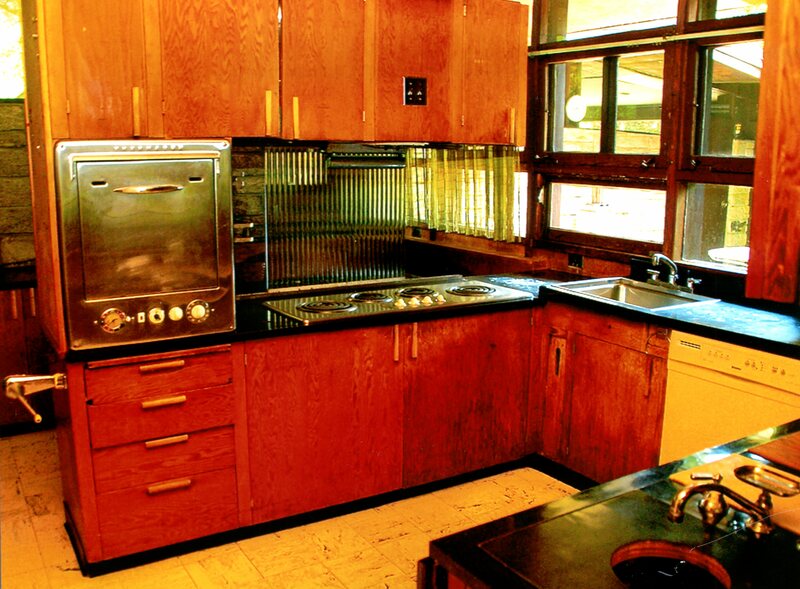 He saved some of the original cabinetry and has the original blueprints. 1953 - aka Woodstock. No address or photo or any other information. 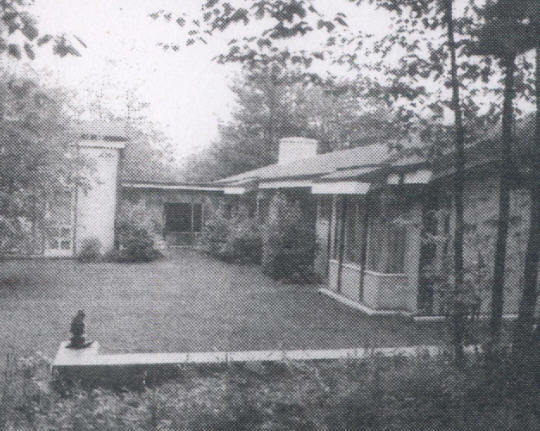 1954 - The Christine Herter Kendall House, aka the Garth Newel House, 403 Garth Newel Lane, Hot Springs VA. Part of the Garth Newell estate of artists William Sergeant Kendall (1869-1938) and his second wife Christine Herter Kendall (1890-1981). Uncomfortable residing alone in the “Big House” after her husband's death, Christine relocated first to Christine’s Cottage, a small vernacular cottage on site. 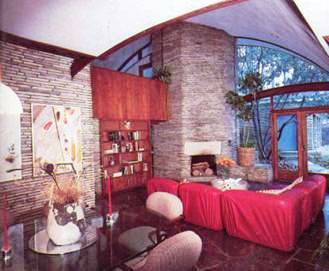 In 1954, she moved to Kendall House, a Modernist one-story ranch house designed by Fitzgibbon. Thenew house included a free-standing studio where Christine continued to paint until her death, though on a diminishing basis. 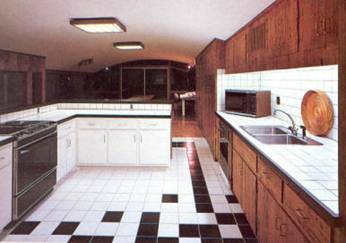 This Ranch-style house was built by Christine Herter Kendall as her personal residence; she continued to live in the house until her death in 1981. The dwelling is constructed of stone and wood-trimmed stucco panels and has a low-pitched, asphalt-covered, side-gable roof. The façade features a 3/4-width covered front porch, off-center recessed entry, a clerestory shed dormer and garage wing that extends forward from the east corner. The west end wall features a glass curtain wall, typical of the period, positioned within the gable end, above lower stucco panels. 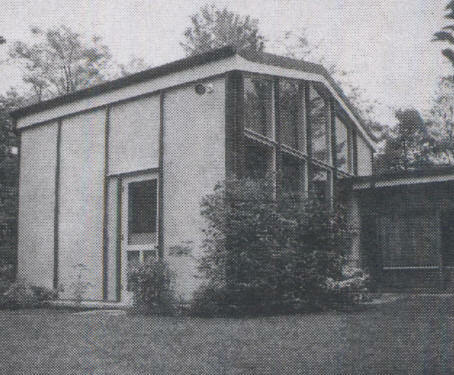 The original design included a freestanding studio space at the rear that was connected to the house by a breezeway. 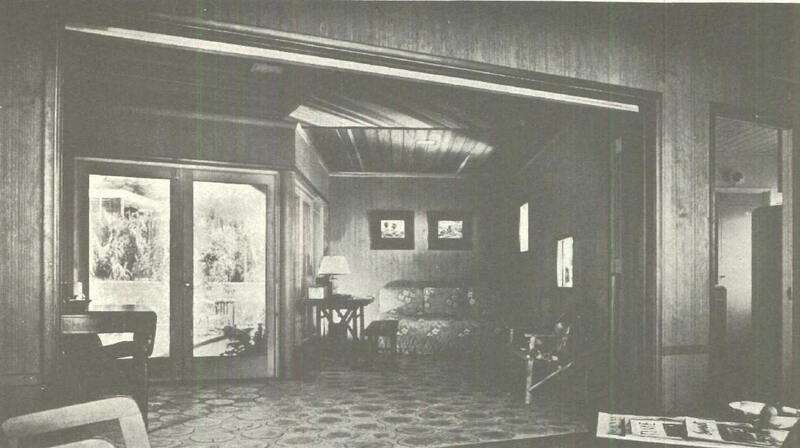 Around 2000, this breezeway was enclosed to create a solarium. And a kitchen and bath were added to the studio to create an apartment. Kendall House is the only building attributed to Fitzgibbon in Virginia. It is not known how Fitzgibbon and Christine Kendall became acquainted. Christine had artist friends in Winston-Salem and she is known to have traveled there on occasion. She is also known to have been acquainted with Buckminster Fuller, though it is not clear whether she knew him prior to her association with Fitzgibbon or if Fitzgibbon introduced them. 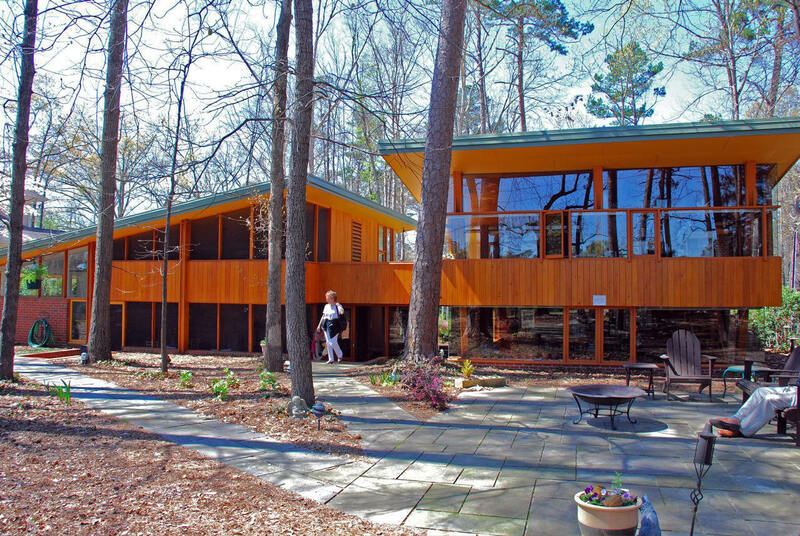 Garth Newel remains today as the only residential music center in Virginia that exists strictly for the study and performance of chamber music. 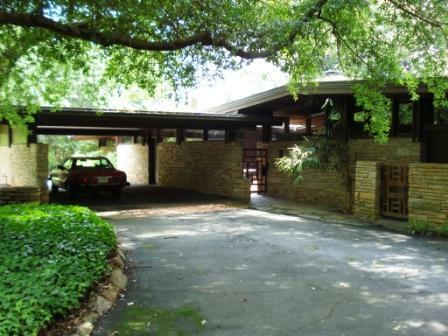 1968 - The Florence Francis House, 1515 Battery Drive, Raleigh. In 1962, unable to fly home from Puerto Rico directly, Fitzgibbon found himself overnighting in a hotel in Antigua. There he met assistant manager Florence Irving Francis, originally from Raleigh. They struck up a friendship. Later that year, Francis and her husband returned to Raleigh. 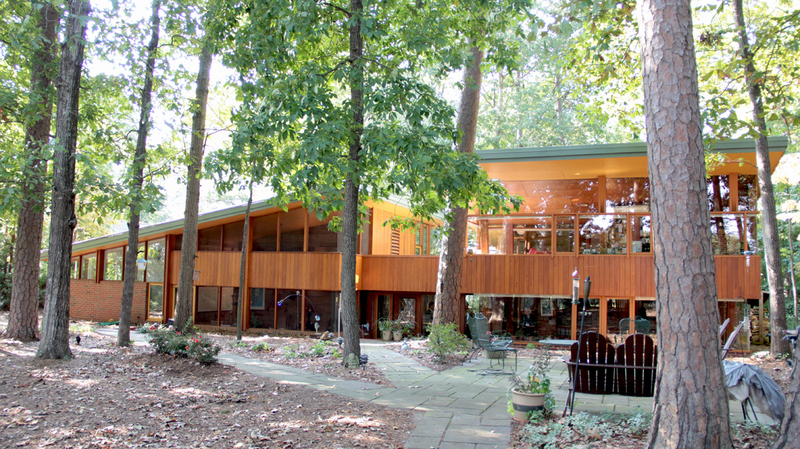 In 1968, they asked Fitzgibbon to design them a home on a narrow lot in Southeast Raleigh. As of 2011 still owned by Florence Francis. 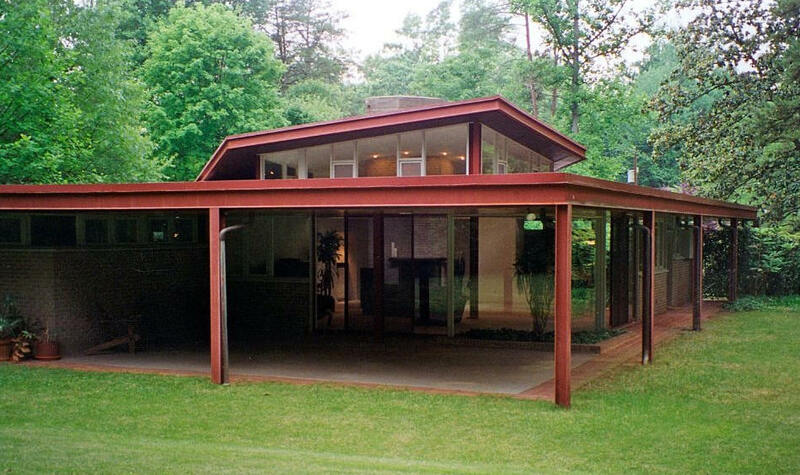 1968 - The Gilbert and Nora Gottlieb Residence, 4908 Forestville Road, Raleigh. Fitzgibbon designed an extensive renovation which did not suitably accommodate the Gottllieb’s growing family. Nora Gottlieb, much to Fitzgibbon’s dismay, created her own design improvements. 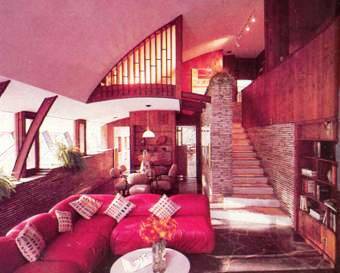 This was his last house design in Raleigh. As of 2011 still owned by the Gottliebs. Photos by Leilani Carter. Year Unknown - The Brewer House model. No address or photo. 1950's - Chapter house for Alpha Chi Omega Sorority, Norman OK.
Sources include: The Missouri Historical Society, Peter Calundruccio, Nora Gottlieb, Florence Francis, Heather Tucker, Heather Fearnbach, Beth Khalifa, Brian Shawcroft, Preservation North Carolina, School of Design: The Kamphoefner Years 1948-1973 by Roger Clark, Sybil Shumaker, Lexi Whitaker, his sister Marifrancis Fitzgibbon Hardison, NC Architects and Builders; Katrina Fairley.